Israeli officials have criticised a reconciliation deal between rival Palestinian factions, Fatah and Hamas. The foreign minister, Avigdor Lieberman warned that Israel would not negotiate with the new unity government. The US also responded coolly, saying the government that resulted must recognise Israel and renounce violence. Under the agreement brokered in Egypt on Wednesday, an interim Palestinian government will be formed and a date fixed for elections. 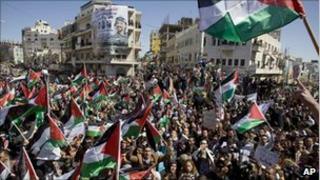 Palestinians hope the move will end infighting that was politically damaging and caused hundreds of deaths. The Fatah party of the Palestinian Authority President Mahmoud Abbas - which runs parts of the West Bank - and Hamas, which governs Gaza, have been divided for more than four years. Their surprise deal, announced and brokered in Cairo, came after months of failed rounds of talks. "It needs to be clear that such an agreement crosses a red line," Mr Lieberman told Israeli military radio on Thursday. "The significance of the agreement is that... hundreds of terrorists will flood the West Bank and therefore we need to prepare for a different situation," he added. He threatened measures to restrict the freedom of movement of Mr Abbas and the Palestinian Prime Minister Salam Fayyad and freeze the transfer of taxes collected by Israel for the PA. Earlier the Israeli Prime Minister, Benjamin Netanyahu, warned that the PA could not have peace with both Hamas and Israel. "I hope the Palestinian Authority will make the right choice - peace with Israel," he said. Hamas has carried out bombings and rocket attacks against Israel for years and does not recognise its right to exist. Thousands of Palestinians protested in Gaza this month, calling for reconciliation. The protests were inspired by uprisings elsewhere in the Middle East and North Africa. Further demonstrations were planned for 15 May. The split between Fatah and Hamas occurred when violence erupted a year after Hamas won Palestinian elections in 2006. Hamas seized control of Gaza in 2007. March 2006 - Hamas government sworn in. US and EU suspend ties. June 2007 - Hamas seizes control of Gaza from Fatah after continued fighting. Unity government dissolved, Israel tightens blockade of Gaza Strip. The BBC's Jonathan Head in Cairo says that if the deal goes ahead, it will end the bitter hostility between the two sides and remove a significant barrier to the Palestinian campaign for statehood. But he says there are many difficult issues to resolve - such as how the two factions will share security, how Gaza and the West Bank, separated by Israeli territory, will be governed, and whether the international donors will be willing to recognise Hamas. Fatah and Hamas had been close to a deal last year but Hamas withdrew, saying the terms had been revised without its agreement. Mr Abbas has since been pushing for reconciliation. The BBC's Wyre Davies in Jerusalem says the Netanyahu government has repeatedly said it will not sit down and talk about a two-state solution if Hamas is any way involved. Mr Netanyahu told the Palestinian Authority on Wednesday: "There cannot be peace with both [Israel and Hamas] because Hamas wants to destroy Israel and says so openly. It shoots missiles at our cities, it fires anti-tank missiles at our children. "I think that the idea of reconciliation shows the weakness of the Palestinian Authority and raises the question whether Hamas will take over Judea and Samaria [the West Bank] as it has taken over the Gaza Strip." US National Security Council spokesman Tommy Vietor said: "The United States supports Palestinian reconciliation on terms which promote the cause of peace. "Hamas, however, is a terrorist organisation which targets civilians. To play a constructive role in achieving peace, any Palestinian government must... renounce violence, abide by past agreements, and recognise Israel's right to exist." Violence between Israel and militant groups in Gaza escalated this March following a rocket attack on an Israeli school bus that killed a teenage boy. Israel also launched a full-scale ground operation - named Cast Lead - in the Gaza Strip that began in December 2008 and ended in January 2009. Are you in the Palestinian territories or the wider region? What is your reaction to this apparent deal between Fatah and Hamas? You can send us your views using the form below.